Its beginning to look a lot like Christmas with heavy white frosts, the first we’ve seen this winter. The farm animals, by now, are all housed and there is very little agricultural activity on the land. Dioxazine Purple is the underlying colour and this gives a coolness in keeping with the subject. The blue is Cerulean, a warm soft colour. The purple was used to darken the blue at the top of the sky. It was also used in the distance to add atmosphere. 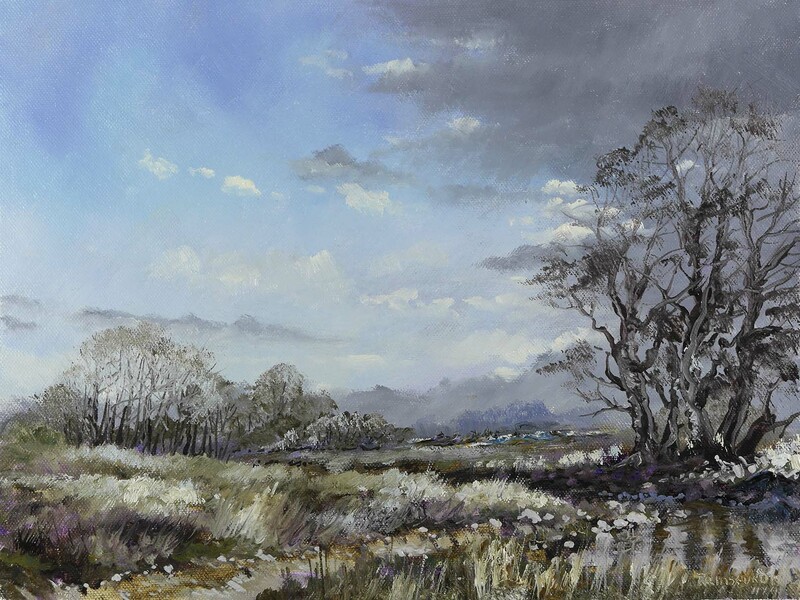 When I painted the foreground, I left as much purple under-colour as possible. The green in this area is a very subtle shade produced by adding a little blue to raw sienna. This was a rich mid tone and when pure white was added to represent the frost it produced nice highlights of green. The 4 colours used were: Raw Sienna, Raw Umber, Dioxazine Purple, Cerulean Blue plus black and white. There was no medium used, only White Spirits. Here’s the video of the process, which took about an hour and a half. The painting is 12″ x 9″. See you soon. This entry was posted in Oil Painting and tagged Art, Christmas Scene, Culture, Education, Irish landscape, Oil Painting, Pictures, Time lapse painting, winter. Bookmark the permalink. Ah yes, it’s looking chilly. Love your middle background treatments on this one. And the wisps of darker blue left in that sky. Brilliant!